Chester, PA – In his third consecutive year of being selected a preseason All-America, senior All-America wide receiver/returner Anthony Davis (Upland, PA/Chester) added his fourth such honor this summer in being picked by D3Football.com. Davis earlier this summer was named a preseason All-America by Lindy’s Sports Magazine, the Sporting News and the Beyond Sports Network after being cited by D3Football.com, Beyond Sports Network and the Sporting News last year. He was tabbed by the Beyond Sports Network in 2012. Davis is one of the nation’s most electrifying players from both an offensive and special teams side whom many teams have to change their game plan around. Among his accolades from last season include being named Beyond Sports Network and D3Football.com first team All-America, ECAC South and Middle Atlantic Conference Offensive Player of the Year and first team All-MAC as both a wide receiver and on special teams. Davis ended last season sixth in the country with 9.1 receptions per game, 19th with 105.6 receiving yards per game, 29th with 10 touchdown receptions and 48th with 144.0 all-purpose yards per contest. He also easily broke the school's single-season record with 91 receptions, bettering his own personal high by 27 catches even with all of the extra attention on the field. Going into his senior campaign, Davis enters fifth in team history with 35 touchdowns, second with 5,035 all-purpose yards, second with 31 touchdown receptions, second with 187 receptions, tied for fourth with 2,711 receiving yards, first with 67 kickoff returns and first with 1,515 kickoff return yards. Widener for a third straight year goes into the season with a preseason ranking as it was picked 25th according to Lindy’s Sports Magazine. It went into last year preseason ranked as high as 15th and in 2012 as high as sixth. Widener as a unit has plenty to look forward to this year after it has gone into the final regular season game the last three years with a chance to win the league and advance to the NCAA Tournament. The Pride this season return six of their 11 players that were named all-league including sophomore quarterback Seth Klein (Wernersville, PA/Wilson West Lawn), who was the MAC Rookie of the Year and ECAC South Offensive Rookie of the Year. A new face will roam the sidelines as Mike Kelly takes over as head coach. Kelly served at Division II Valdosta State from 1997-99 where he led the team to a 16-15 record and coached three All-Americas and 23 All-Gulf South Conference players. He also served as associate head coach at San Francisco State (1990-92), offensive coordinator/quarterbacks coach at Capital (1987-90), offensive coordinator/wide receivers coach at Ohio Wesleyan (1986-87), running backs coach at Marietta (1983-86) and wide receivers coach at Edinboro (1982-83). Kelly also was the head coach of the Winnipeg Blue Bombers of the Canadian Football League in 2009, the offensive coordinator for the Blue Bombers from 1992-96, an offensive consultant and NFL Scout for the CFL's Edmonton Eskimos in 2000 and the Eskimos receivers coach in 2008. In the National Football League, Kelly was a scout and offensive assistant coach for the Philadelphia Eagles (2001-02), a personnel assistant with the Washington Redskins (2003-05), and a game advance consultant for the New York Giants (2010). He also served as offensive coordinator for the Orlando Rage of the now defunct XFL in 2000. 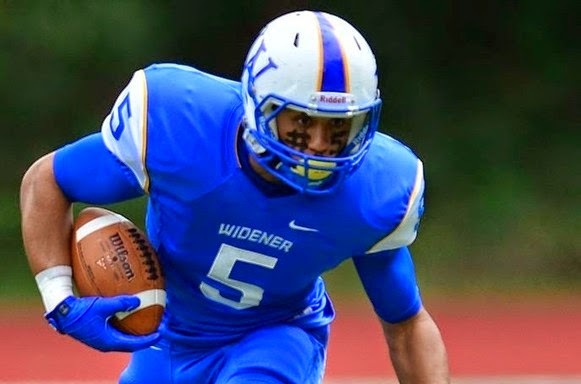 Widener opens its season September 5 at Rowan.